As I type, there is a quintet of kitchen pots doing double duty as drip catchers in my family room. I wouldn’t mind so much a drip…drip…drip, a slow harmony but last night’s rain has produced a fast, furious drum beat, a constant downpour in my home. My husband has just discovered that the roofers stacked the roofing material in one spot, in such a way that the rain funneled directly through the most vulnerable part of the roof. So far, no serious damage has been done–artwork, electronics, and wood flooring (and don’t forget, my cookbooks!) are still intact but the day is young. Keeping my fingers crossed. At least I have some good things to share from my kitchen. 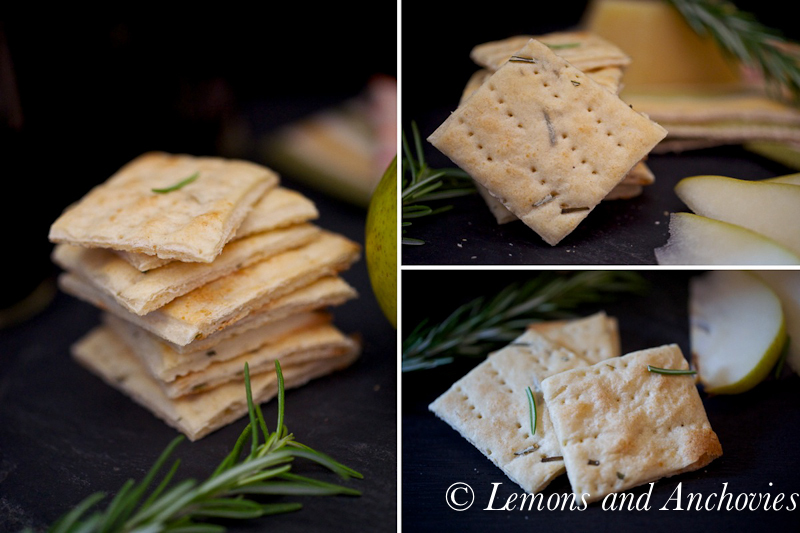 You might remember the Sea Salt and Pepper Crackers I made earlier this year. After that successful first attempt at making crackers, I was determined to have another go with a different flavor combination. My friend Roxana at A Little Bit of Everything actually beat me to it and created her own variations out of the base recipe with much success. 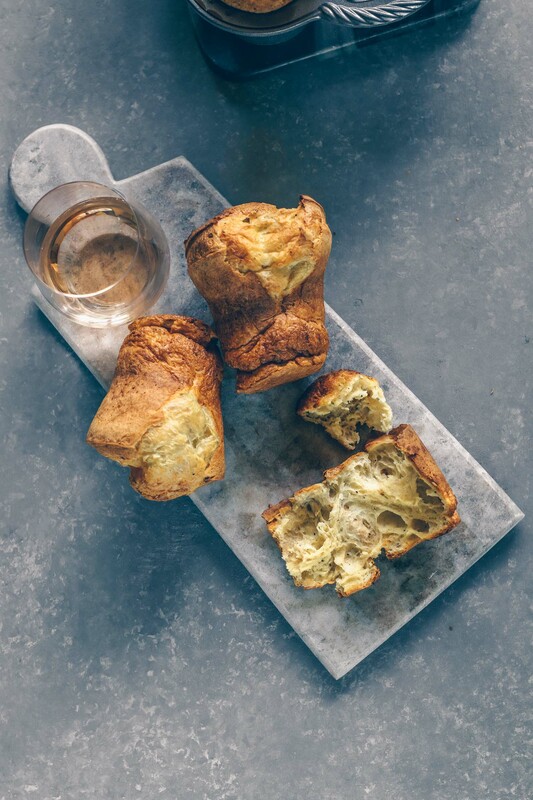 Her cinnamon-sugar combination is on my list to try but my heart has been set on a cheese-herb duo since that first time. These were just as simple to prepare as the salt and pepper crackers. In my excitement to pop the finished product in my mouth, I forgot to add the chopped rosemary in the food processor. Instead, and I think this worked out better, I sprinkled the chopped herbs on the dough as I kneaded it. 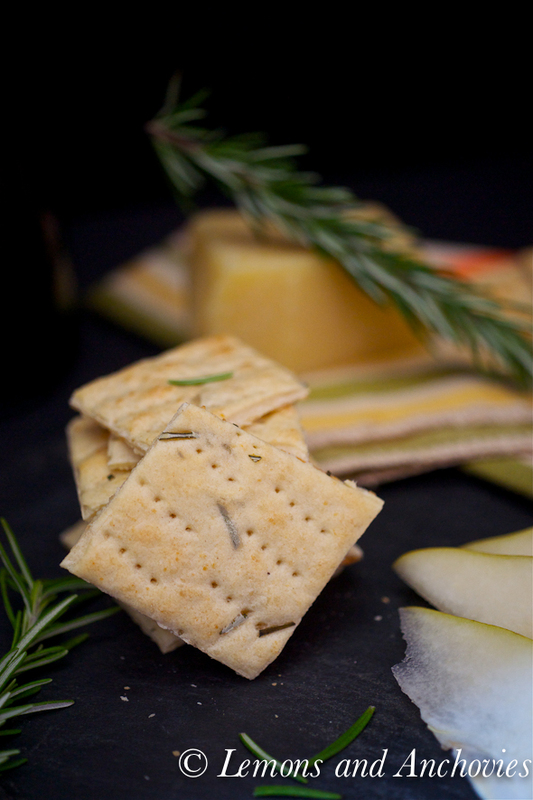 The finished crackers were fragrant from the fresh rosemary. I was conservative with the grated Parmigiano but you can taste it as a secondary note after the rosemary. Again, these were such fun to make (and even better to eat); wine o’clock arrived early in my home that day. * I baked these at lower temperature. Instead of 450 degrees, I baked these at 415 degrees. * Add the cheese at the same time you pulse the flour, sugar and salt. 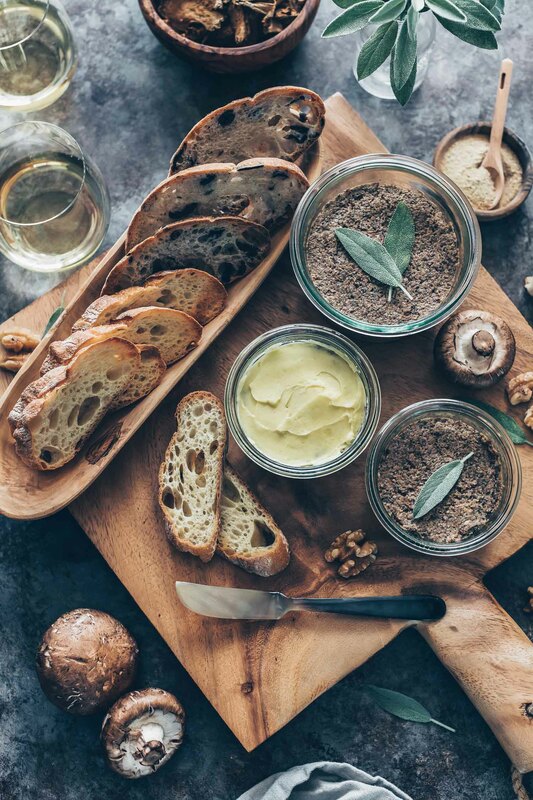 * Sprinkle the chopped rosemary on the dough as you knead it. Don’t add the entire tablespoon all at once, add as you knead and the herbs will be distributed evenly. they sound really good, and i love your expression “wine o’clock!” i will definitely make these very soon, like tonight! Oh my gosh, those look so good–buzzed! Yum! 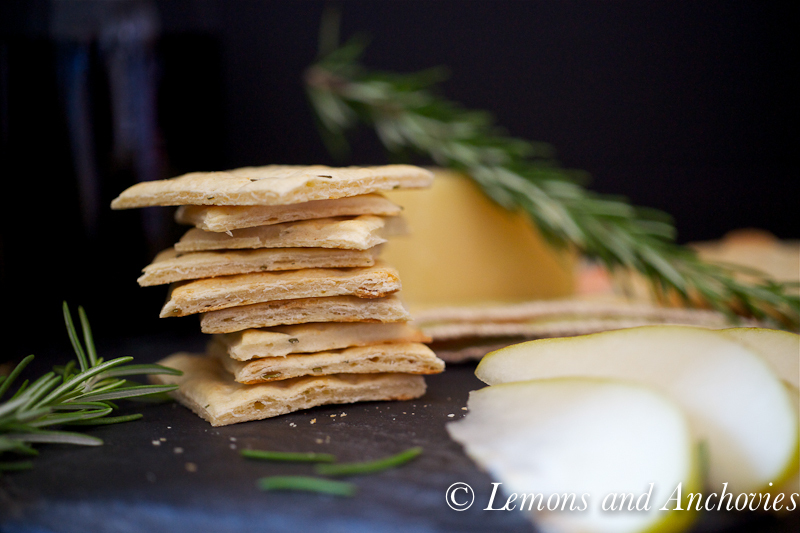 I made some homemade cheese nibs this summer and am now hooked on homemade crackers. Can’t wait to try this! Your crackers look like they came out of a professional bakery! WOW! Bet they taste much much better than commercial ones however! Jean – these look just DIVINE! I am making these very soon. Love your photos too! Have a great weekend!!!!! Wonderful photography! 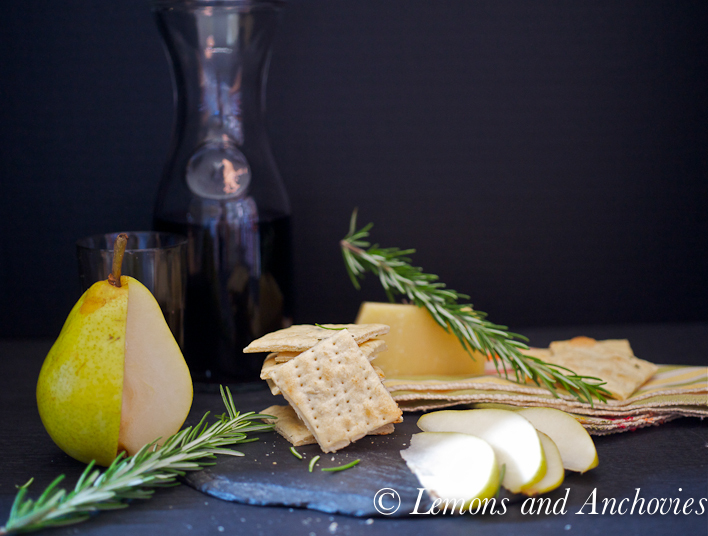 Your arrangement with a carafe of wine, the pear, and rosemary sprigs is absolutely gorgeous. Brava! Have to try baking crackers! They look soo good! These look great! Beautiful photos! These look wonderful. I should have a project one weekend of making homemade crackers. I can only hope they will be as pretty as yours. Best of luck with the roof. These would be perfect for dipping in soups or topping with various toppings for holiday hors d’oeuvres. What beautiful crackers. Thank you for sharing another delightful recipe with me. I’m sipping on a cup of tea and will soon be dreaming savory dreams. Hugs and love from Austin! This sounds so good. I just was eating dip with store bought crackers. I can only imagine how much better it would have been with these. I’ll have to give these a try. Glad there’s no rain & water damages – there’s nothing quite like water damages, especially on books and wood! These look amazing! I bet they’re incredible, definitely have to try this out. Everything you make belongs in a magazine! I’ve never even considered making crackers, but I might have to for the holidays. It’s such a neat idea! These look delicious and perfect for on-the-go (which these days suffices for “I’m still home but haven’t had time to eat) 🙂 So good to see you this weekend, friend! Yes I remember your other cracker recipe. You really make very nice homemade crackers. 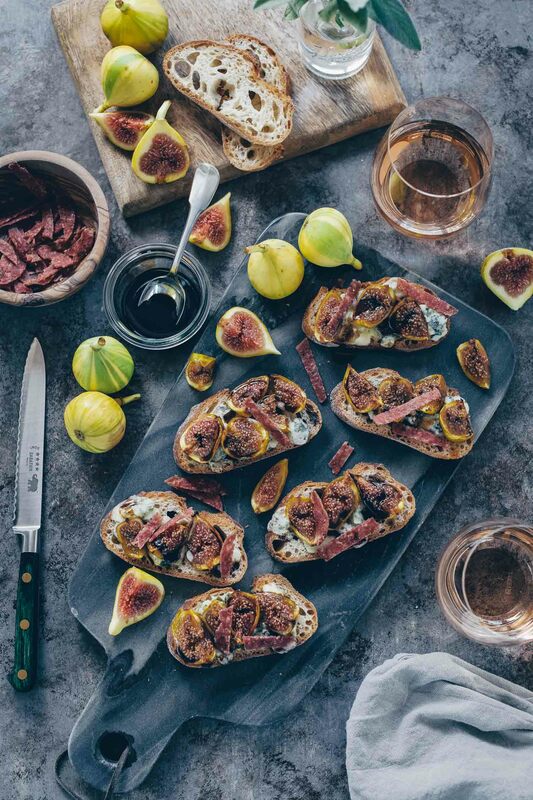 It’s a perfect healthy snack and these days we drink soup a lot and I just can’t imagine having this together…. Jean, your photos are beautiful! These look delicious! Love your photos too! I made crackers for the first time last night and couldn’t believe how easy it was! This is different from the recipe I used so I definitely will have to try it. They look delicious! Love the pics! Now I want some chowder to go with the crackers. I love this fall weather ;-). Thanks for this post! I made this to accompany the clam chowder I made this weekend. I even got my toddler to help me roll and cut the crackers. Fun and tasty! Plus I saved some for our weekend cocktail and cheese time!